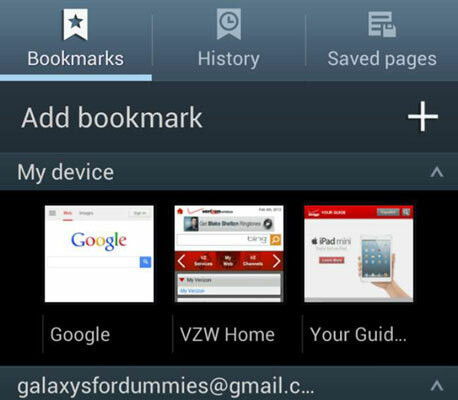 Chances are that your carrier already put in a number of bookmarks. Some are for popular sites; others help you manage your account. The point is that you can add your own sites. Tap the button that says Add Bookmark. The first textbox is the name you want to call the bookmark. In this case, the default is Mobile Refdesk. You can choose to shorten it to just Refdesk, or anything you want to call it. When ready, tap Next on the keyboard. The second textbox is the web address (URL). You probably want to leave this one alone. Just tap Next again. Tap the Save button at the upper right corner of the screen. 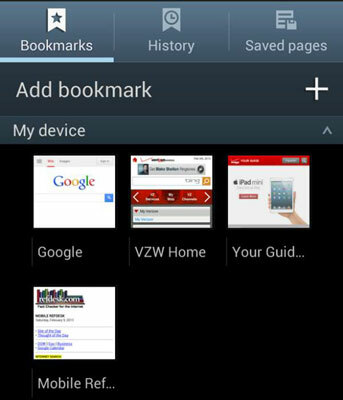 This puts a thumbnail of the website in your Bookmarks file. The next time you come to Bookmarks, you can tap this thumbnail, and this page will refresh and come up in its own window.